The Great Depression of the 1930s was blamed on free markets and brought a vast expansion of government interference with the economy. Then came the II World War and with that the position became even worse with government controlling all aspects of the economy in USA. After the war, when anybody who favored rolling back the power of government inevitably faced the question, 'What about the Great Depression?'. Without all the laws from that era, it was feared, there would again be high unemployment, chronic monopolies and gross inequalities. Nobel laureate Milton Friedman did more than anyone else to change thinking on these issues. He gathered massive documentary evidence to show that the Great Depression occurred primarily because the money supply contracted by one-third between 1929 and 1933, although the Federal Reserve (Central Bank) in USA had been granted the power to prevent such a catastrophe. Milton Friedman argued that the Great Depression was a government failure. Further he also proved that - inflation is always and everywhere a monetary phenomenon. He made a formidable case that government 'fine-tuning' is more likely to backfire: by the time Central Bankers realize that the economy is slipping into a recession or depression and they inflate the money supply, the effects are likely to be felt after the economy has already recovered, worsening the subsequent inflation. Conversely, by the time Central Bankers realize inflation is a problem and they contract the money supply, the effects are likely to be felt after the economy has slowed down, worsening the next recession or depression. Thus Friedman effectively proved that Government is the biggest source of instability in the economy. All this he proved in his most important single work on economics called 'A Monetary History of the United States 1867 - 1960' which he co-authored with Anna Jacobson Schwartz and which was published in 1963. Many champions of liberty have generally done well to achieve significant impact on a single area of public policy. Bur Friedman has had a significant impact on many public policies in USA. He helped usher in the era of free foreign exchange markets. He campaigned for ballot initiatives to limit government spending and taxes. He inspired the movement for educational choice using tuition vouchers that would enable poor people to opt out of public schools. He courageously spoke out against drugs prohibition and he helped fight President Clinton's effort to seize an eighth of the US economy in his plan for Government-run health care. His greatest achievement of which he was most proud was that of helping to end military conscription in the United States. Milton Friedman was born on 31 July, 1912 at Brooklyn in New York. He entered Rutgers University in 1928. He graduated from Rutgers University in 1932. He moved over to University of Chicago in 1932 for higher studies. In Jacob Viner's Price Theory class, the student who always sat next to him was the petite and lively Rose Director. She was to become his future wife. She was doing Ph D in economics under Frank Knight and Friedman worked as assistant under another economics professor Henry Schultz. Friendship between the two developed into romance and Milton and Rose got married in New York on 25 June, 1938. Another Chicago economist Henry Simons had a big impact on Friedman. In 1934, Simons wrote A Positive Programme for Laissez Faire in which he emphasized that people generally share common goals, such as promoting prosperity and the major differences of opinion are often about the most effective ways to achieve the goals. Friedman won over millions by embracing this fundamental approach and making a practical case that private individuals in competitive markets are much better at solving problems than bureaucrats are. 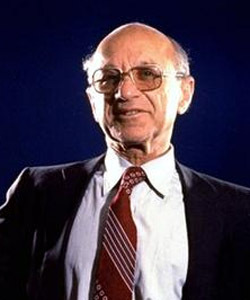 Simons had warned that political liberty can survive only within an effective competitive economic system and this became a major theme of Friedman. In 1937 Friedman went to Columbia University to do his Ph D. In September 1937, future Nobel laureate Simon Kuznets invited Friedman to work at the National Bureau of Economic Research where he studied independent professionals, lawyers, accountants, engineers, dentists and doctors. This work became the basis for Friedman's doctoral dissertation and first book, Income from Independent Professional Practice, co-authored by Simon Kuznets. From 1941 to 43, Friedman worked in the Treasury Department's Division of Tax Research. In September 1946, Friedman began teaching at the University of Chicago and became an international celebrity. His most widely quoted essay The Methodology of Positive Economics published in 1953 maintained that when one makes statements about phenomena, they ought to be verified by some kind of observation. The primary test of economic analysis is the correctness of predictions. In 1956, William Volker Charities Fund arranged for Friedman to deliver a series of lectures about general principles and major public policy issues such as unemployment, monopolies, racial discrimination, social security and international trade. His wife Rose Friedman edited the lectures into a book, Capitalism and Freedom, which the University of Chicago published in 1962. This book went on to sell some 500,000 copies. It was smuggled into the Soviet Union and served as the basis for an underground edition. After the fall of the Berlin Wall in 1989, this book was translated into Serbo-Croatian, Chinese, Polish and Estonian and many other languages. In 1966, Newsweek's editor invited Milton Friedman to contribute a weekly column on public issues. All his writings in Newsweek were collected and published in three volumes : An Economist's Protest (1972), There's No Such Thing as a Free Lunch (1975) , and Bright Promises, Dismal Performance (1983). Milton Friedman continued to contribute articles to the Wall Street Journal, New York Times, Washington Post, San Francisco Chronicle and other publications. In 1976 he was awarded the Nobel Prize in economics for his work in the field of consumption analysis, monetary history and stabilization policy. His theory of monetarism, adopted in part by the Nixon, Ford and Reagan administrations, opposed the traditional Keynesian economics that had dominated US policy since the New Deal. He was a member of Reagan's Economic Policy Advisory Board. In 1977, Friedman was requested to present a TV programme under the title Free to Choose and the first part of this programme was broadcast in January 1980. It became one of the most popular programs around the world. Later it came in the form of a book Free to Choose and became the top selling non fiction book in the 1980s. It was translated into 17 languages. In numerous books, a Newsweek magazine column and a PBS show, Milton Friedman championed individual freedom in economics and politics. He pioneered a school of thought that became known as the Chicago school of economics.